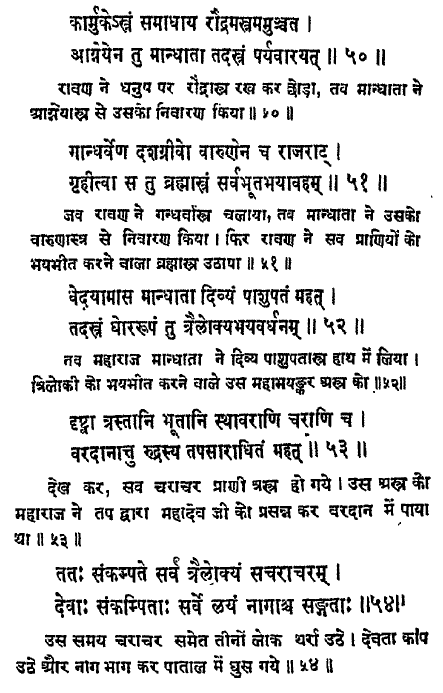 Here, it is said that Māndhātā was a cause of fear to many thieves including Rāvaṇa. Was there an encounter between them like a meeting or a war where Māndhātā created fear in Rāvaṇa? Where is the story which caused fear in Rāvaṇa? O foremost of Rishis, do thou tell me, who, of these kings going, if prayed for, may offer me the hospitality of a battle? For sooth thou art my father;do thou point out (such a man to me) O thou conversant with piety." O great king, all these kings wish for heaven not for battle. I shall point out such a man, O great one, as shall enter into conflict with thee. There is a highly powerful king the lord of Seven islands, well known by the name of Mandhata; he shall enter into an encounter with thee." The Ten necked Rakshasa said to Mandhata: Do thou give me battle. Being thus addressed, Mandhata, laughing, said to the Ten necked Rakshasa If thy life is not dear unto thee, do thou fight with me, O Rakshasa. Hearing the words of Mandhata, Ravana said Ravana did not experience any affliction from Varuna Kubera or Yama; why should he experience fear from thee, who art a man? Having said this, the lord of Rakshasas as if burning in fire, ordered the Rakshasas irrepressible in battle. Thereupon the ministers of the vicious souled Ravana, highly enraged and well skilled in warfare, began to make a downpour of arrows. Thereupon the highly powerful king Mandhata, with sharpened shafts, assailed Prahasta, Suka, Sarana, Mahodara, Virupaksha, Akampana and other foremost heroes. Prahasta covered the king with his arrows but before they had approached him, that foremost of men shattered them into pieces. Like unto fire burning down grass, the host of Rakshasas were burnt down by the king Mandhata by means of hundreds of Bhushundis, Vallas, Vindipalas and Tomaras. As Kartikeya, the son of fire, sundered the mount Krauncha with his shafts so Mandhata, enraged, pierced Prahasta with five Tomaras gifted with great velocity. Then hurling his mace again and again resembling that of Yama, he struck, vehemently, Ravana s car therewith. That club, resembling the lightning, vehemently descended (upon Ravana's car)and Ravana, like Sakra's banner, was speedily upset by that. Like unto the rising of the waters of the Salt ocean on the full moon, the king Mandhata s joy and strength were greatly increased. Thereupon the entire Rakshasa host, emitting loud cries, stood encircling on all sides the lord of Rakshasas. Thereat speedily regaining his sense, Ravana, a terror unto all people, the lord of Lanka, greatly assailed the person of Mandhata. And beholding thtt king in a swoon, the highly powerful night rangers were greatly delighted and emitted leonine roars. Regaining his sense in a moment the king of Ayodhya beheld his enemy worshipped by the courtiers and night rangers. He was instantly worked up with fire; and assuming a person resplendant like that of the sun and the moon he began to slay the Rakshasa host with a dreadful downpour of shafts. With his arrows and the noise thereof the entire Rakshasa army were overwhelmed like the agitated deep. Thereupon there arose a dreadful conflict between men and Rakshasas. And those two heroic, high souled and foremost of men and Rakshasas seated on warriors seats and holding bow and daggers entered (the field). And possessed by great anger they began to assail one another with shafts Mandhata Ravana and he again the king. They, being assailed by one another, were both wounded. And setting the Raudra shaft upon his bow Ravana discharged it and Mandhata baffled it by means of his Agneya (fiery) shaft. Dasagriva took up the Gandharva weapon and the king Mandhata baffled it by means of his VarunAstra. Ravana then took up the Brahmastra stricking terror unto all. The king Mandhata took up the celestial Pasupata weapon, dreadful and increasing the fright of the three worlds, obtained by him from Rudra by virtue of his rigid penances. Seeing this all animals, mobile and immobile, were stricken with terror. Thereupon trembled all the three worlds consisting of mobile and immobile beings the Devas and all the Nagas became inert. Being apprised (of this conflict) by vitue of meditation the two foremost of ascetics Pulastya and Galava remonstrated with them in many a way and stopped the king Mandhata. Not the answer you're looking for? Browse other questions tagged mythology bhagavata-purana ravana .